Bed Bug symptoms aren’t always clear. But its very important for you to know the 6 signs and symptoms if you think your house is infested. Bed bugs can be introduced into your residence from used furniture (beds, couches) as well as via your luggage after returning from a holiday. If you can’t pinpoint the source of the bed bugs, there are numerous common symptoms that can help you to decide whether you’re dealing with a bed bug infestation. So what are the Bed Bug Symptoms? One of the first symptoms of the existence of bed bugs is the nasty red rash. A bed bug rash is usually itchy, and in some people, it can also be very inflamed. It looks like a cluster of tiny mosquito bites or flea bites. Bed bugs can bite you anywhere on your body including on the arms, legs, torso, back, neck, and face. The rash may be localised to one part of your body or be apparent all over your body. You can identify bed bugs simply by doing a good inspection. Check your bed, bedding, mattress, covers and the furniture surrounding your bed. Pay particular attention to cracks and crevices, because bedbugs like to hide in very dark spots. Fully grown adult bed bugs can be easily seen by the naked eye, yet signs of smaller bugs in various bed bug life cycle stages may be more difficult to spot. Another common bed bug symptom is blood stains on your sheets and pillowcases. Blood stains can come from bed bugs that may have been squashed during the night after being rolled on. It’s very important to remember that blood stains alone may not indicate the presence of bed bugs. If you find blood stains on your sheets, you should try to identify other of bed bug symptoms before assuming you have a bed bug infestation. The faecal droppings of bed bugs may appear as tiny, smeared brownish-red or rusty-coloured spots on your mattress or bedding and on the areas around the bed. They may also be present along with bed bug castings and bed bug eggs. As bed bugs move to the next life cycle, the bed bugs shed their outer skin. The skin is hollow and light-coloured. Castings of various sizes, as well as bed bug egg shells, may be visible on your bed sheets and bedding if you look close enough. Bed bugs can also give off an odour from their scent glands which may be very mild and musty or stronger if there is a large infestation. It is often described as similar to that of berries. Although there hasn’t been much research into bed bug odours, scientists think that the scent glands and the scent may attract other bed bugs for reasons such as mating and forming colonies. Are you still not sure if you have bed bugs? 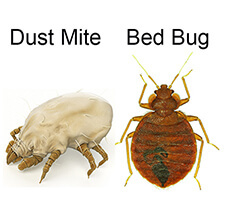 Try our instant bed bug identification. Simply take a clear photo of the bugs or bites and send them to us! Find out more about how we can help you to identify bed bugs in your home or hotel here.